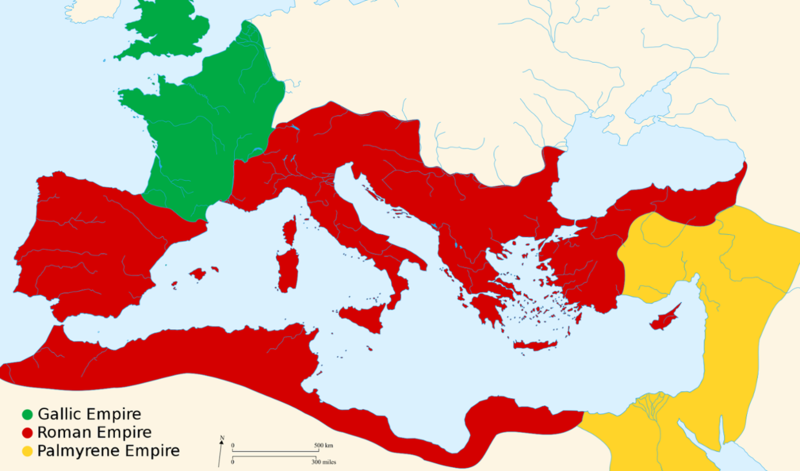 During the Crisis of the 3rd Century, the Roman Empire was plagued by a series of bloody civil wars, in addition to plagues, famines, and invasions. By 268 AD, the Empire had split into three separate states - the Gallic Empire (Gaul, Brittania & Hispania), the Palmyrene Empire (Syria, Palaestina & Aegyptus), and the remains of the Roman Empire covering Italy, Greece & North Africa. This category covers coins from these seccesionist empires. Obverse: IMP C AVRELIANVS AVG, radiate & cuir. bust of Aurelian right,, H under bust. Reverse: VABALATHVS VCRIM DR, Laur., dr. and cuir. bust of Vabalathus right. Reverse: PAX AVG, Pax standing left with branch and sceptre. (26) Tetricus II 273-274 A.D.
Obverse: C PIV ESV TETRICVS CAES, radiate, draped bust right. Obverse: Vabalathus "VABALATHVS VCRIM DR"
(36) Victorinus Autumn 269 A.D.
Obverse: IMP C VICTORINVS PF AVG, Radiate, cuirassed bust right. Reverse: SALVS AVG, Salus standing right feeding serpent in arms.